One of central London’s most affluent neighborhoods, Marylebone has a history dating back to the 17th century. Stretching north of Oxford Street to Regent’s Park, the village-like district is known for its Georgian architecture, fashion boutiques, and unique museums. Home to some of London’s most luxurious hotels, Marylebone makes an atmospheric base for travelers, within strolling distance of Oxford Street shops. The neighborhood also has a number of popular tourist attractions. Madame Tussauds is the original wax museum; the nearby Sherlock Holmes Museum is located at 221B Baker Street, just like in Sir Arthur Conan Doyle’s books; and the Wallace Collection is a museum of art and antiquities housed in a gorgeous 18th-century residence. Most of Marylebone’s shops and restaurants are located on or around Marylebone High Street. Most shops in Marylebone are open daily from 9am to 7:30pm, while Sunday hours are restricted. Marylebone train station and Bond Street Underground are the closest stations with wheelchair access. Marylebone Village is centered around Marylebone High Street and is bordered by Marylebone Road to the north and Wigmore Street to the south. There are several underground stations in the area, but the most central are Baker Street (Bakerloo, Circle, Hammersmith & City, Jubilee, and Metropolitan Lines) and Bond Street (Central and Jubilee Lines). Head to Marylebone in the day to shop or stroll through Regents Park, or in the evening to sip cocktails with the locals or dine at one of the many restaurants. The village hosts a number of annual events, including the Marylebone Summer Festival in June and Marylebone Food Festival in April. It’s also an advantageous spot to admire London’s Christmas Lights. Marylebone Village offers shoppers a much quieter alternative to Oxford Street, with lots of retail shops and designer boutiques. 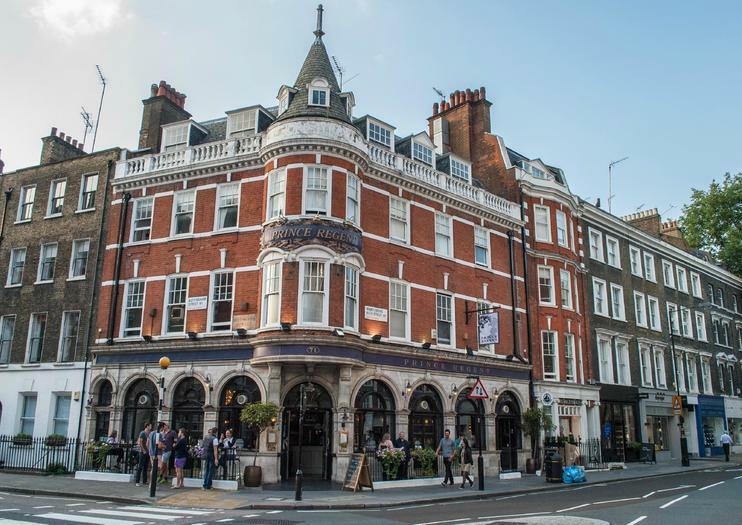 Popular shopping spots include St. Christopher’s Place and Marylebone Lane; the weekly Marylebone Farmers’ Market (Sunday on Cramer Street) and Cabbages & Frocks market (Saturday along the High Street); and Daunt Books, an Edwardian bookstore on Marylebone High Street. There is also a wide selection of cafés, pubs, and bars, as well as top-rated restaurants.